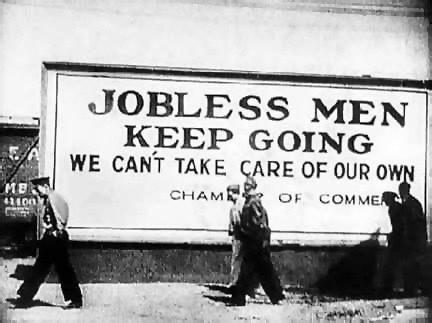 Home › Blogs › Joanne Poyourow's blog › Economic Resilience #3. Rethink the idea of "Jobs"
Economic Resilience #3. Rethink the idea of "Jobs"
"Jobs" as we know them today -- paychecks from large corporate employers -- are a very recent phenomenon in human history. Within our new understanding of the future economy, this form of earning a living is not too likely to continue. Even the idea of “green jobs” is deeply flawed. Many of the “green” jobs are completely dependent upon government funding. Most are built upon the presumption of economic growth, and depend on continued societal affluence to get the fledgling “green” industries off the ground. Some so-called “green” industries merely provide green-cast consumption, perpetuating the five-planets-worth-of-consumption which we have told each other is “normal.” Other supposedly “green” jobs are in tech-centric industries, dependent upon oil, overseas manufacturing, and continued supply of trace elements, all of which will be difficult to sustain as we move deeper into the post-peak-everything era. The role of “employee” of a giant facility controlled by corporate executives is part of the fading past. If we are to achieve the Great Redistribution (NEF, Part II), there will be a redistribution of ownership. As we Relocalize and powerdown, making a living is much more likely to be in the role of “proprietor,” rather than employee. Income sources in the future are less likely to look like paychecks and far more likely to look like local businesses, home businesses, or barter businesses. These small businesses are likely to be providing some of the basic, core services that local community members need, such as food, water, basic shelter, basic clothing, low-input forms of health care, and human services such as psychological and spiritual help in coping with this vastly altered course of events. (more on this at #4 in this series) All those Reskilling classes we create within the Transition movement begin to look very different! Remember that in the not-so-distant past, people thought not in terms of “jobs” but in terms of “trades.” A young boy was sent out to apprentice and learn a craft or a trade. Yes, some people did have jobs, but they were nothing like the massive oil-supported corporate structure we see today. People farmed food, people crafted everyday necessary tools, people made clothing, people nursed each other, all done locally. In a post-petroleum world, the globalized corporate structure is doomed. We will be left with a lot more community-level sufficiency. In our March 2009 economics session in Los Angeles, when we asked the audience the types of businesses we would need for greater resilience here in L.A., the list was extensive and inspiring. Thus more likely possibilities for future livelihoods include small businesses in resilience-building industries, or working for a local businessman within a resilience-building industry. This becomes important not only for “how will I pay the rent” but also when we consider the messages we give our children about educational options and career choices. Shifting our jobs to more-resilient patterns can be a really tough thing to do. Even if our inner landscape is shifting and we’re beginning to grow a few of our own veggies, we still have supermarket grocery bills to cover; we still have rent or mortgage payments. If you are currently employed within a non-resilient industry, perhaps the best for now is to embrace these ideas and prepare for them (after hours education?) even as you continue working the conventional way. Read about the concept of “Two Moving Sidewalks.” And appreciate the preciousness of each remaining conventional paycheck. If you are currently jobless, or are retraining for a future career, you will probably find a more enduring livelihood within the more-resilient industries. Also, within a given industry, some specialties are far better situated for resilience. Health care is a great example: Western allopathic medicine is highly oil-dependent. But many holistic health care modalities use far less inputs, aren’t tied to the massive system, and can provide a cornerstone for local care within your community. Locally sourced rather than international and dependent upon globalization. Expect survival-level cash flow rather than replacement of the salaries of the last decade. Expect to put in place all of the cash-conservation measures listed in bullet #2 of this series. Perhaps try out new skills via Time banking or LETS. (#5 of this series). Build your resume through barter-funded work. Meanwhile the barter credits can help ease your living expenses while you are out of U.S. dollar-generating work. Sophy counseled us that we will feel for a time like we're hopping back and forth between sidewalks. We hop between mainstream life -- perhaps with a competitive corporate job, perhaps with children to get off to college -- and the new ways of the future: the garden, the chickens, the bicycles, the ways of The Great Turning. The Foxfire series of books circa 1970’s (Eliot Wigginton, editor) collected oral histories and customs of the Appalachian region. It presents a glimpse of pre-industrialized rural community life.